Earlier this week, my Dragons supporting buddy Richard and I were trying to work out which Rugby League player, past or present, has benefited the most from having a famous relative. The following email exchange is what we came up with. ME: So, any discussion on Rugby League players that have made their career based on their ‘name’ has to start with a few ground rules. Now, these are just my ground rules, and since this is a completely arbitrary thing, you can feel free to make your own ground rules. 1. The player passes if he surpassed his father/uncle/whoever the relative is, in greatness. This does not mean that he played more tests or Origins or whatever, it is the intangible greatness of which we will be the judges. I’m calling this the Jarryd Hayne rule. He’s clearly a much greater player than his old man ever was. 2. The player passes if they never rose above where their ability would have taken them regardless. I’m calling this the Eric Grothe Jnr rule. He may have the exact same name as his old man, but he didn’t get any more rep jumpers than his ability deserved. 3. Not so much a test, as a note – The player doesn’t actually have to have the same surname as the relative to be eligible. This could also be the Jarryd Hayne rule, but to keep it clear this can be the Braith Anasta rule. Now, I’ve already had my say on Kurt Gidley’s career in a previous article so I’ll leave him out of this, but I’m still going to aim high and I’ll kick it off with Mark Gasnier. The Gasnier name is one of, if not the, most prestigious name in the sport. Having it gives you more than a significant leg up. It gives you a club that doesn’t want you to play for anyone else, it gives you increased media attention, and apparently it gives you 15 tests and 12 State of Origin appearances. 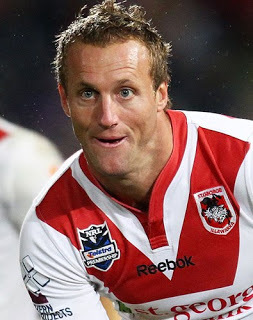 Mark Gasnier was a head wobble in a Red V.
He made his entire reputation on a handful of good games – Scoring a try on debut against a weakened Knights backline, being given a spot on a Kangaroo squad and scoring a try in his first match against the powerhouse of Rugby League the Kumuls, being given a second chance at Origin after being sacked for being a bit of a toey human and in turn scoring 2 tries in a NSW side that was dominant all over the park. The remaining 11 games of his Origin career resulted in a total of 2 tries. He was a flat track bully that was always shown up when playing anyone of quality. 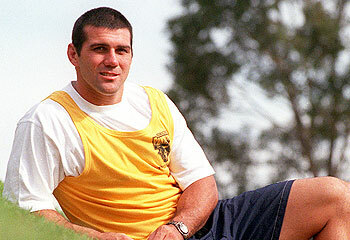 He scored most of his tries against struggling Souths and Tigers teams and continually failed whenever he was pushed. He fails the Jarryd Hayne rule (which was always going to be the case, Reg is an immortal!) and he fails the Eric Grothe Jnr rule. I put it to you that Mark Gasnier benefitted from his surname more than any player that came before him or has come since him. For me this is the most authoritative precedent for riding on the coat-tails of a famous surname in the history of rugby league. Like the Gasnier entry, his relative is also an Immortal, so it was always going to be hard for the young Fulton to step out of his father’s great shadow. Well founded suspicions of nepotism are underlined not only by the fact that he played his entire career at the same club where his father made his name, but was coached by him the entire time as well – it’s more than just a co-incidence that when Bob Fulton stepped down as Manly coach in 1999 that Scott’s playing career abruptly ended the very same year. While Gasnier may have scored hat-trick after hat-trick against weakened Wests and Souths teams – these are, at their base level, achievements of some description. 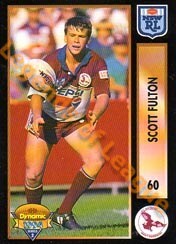 I can’t point to a single highlight in Scott Fulton’s career aside from the fact that he almost played a full season in 1997 when he racked up 21 games in the ARL competition. Even then, you can reasonably suspect that he wouldn’t have been up to the rigours of first grade rugby league had there not been split competitions due to the Super League War that year (he averaged 4.5 appearances per season over four years prior to 1997). He benefited from playing during an era where the Sea Eagles were practically unbeatable, and the shortcomings in his game were no doubt blanketed by being in squads which included gifted and talented players such as Matthew Ridge, John Hopoate, Steven Menzies, Mark Carroll, Ian Roberts and even Craig Field. In a 49-game first grade career spanning seven(!) years, he averaged 7 appearances per season, never really nailed down a starting spot or made any position his own, scored a solitary try, achieved no representative honours whatsoever and just left plenty of questions as to how he maintained a contract with one of the league’s best clubs despite his limited playing ability. The answer is most likely that in order to appease Bob Fulton, the front office at Brookvale had to ensure that a spot in the squad was made for the coach’s son. To be fair to him, and as highlighted before, he came through during a great era of dominance at Manly and he would have been hard-pressed to usurp any of the incumbent halves or hookers (his preferred positions) that played during that time (count them: Cliff Lyons, Geoff Toovey, Jim Serdaris and Owen Cunningham) without drawing a great deal of suspicion or scepticism from team-mates and journalists alike. He always could have pursued opportunities at another club but, come on, who else would have actually signed him? Also in his defence, you might argue that he came through at a time where there was this expectation that if you were the son of a rugby league player, you were expected to play rugby league yourself as some way of carrying on the family legacy – I suspect that there’s room to infer that Scott Fulton was only really thrust into the game at the behest of his father/family rather than genuinely ever wanting to pursue a career in rugby league himself. ME: Scott Fulton is a good one, and on the whole ‘front office needing to give him a contract to keep Bob around’ situation – I actually have a vague memory of accusations being openly made to that effect around the time by some pundits in the media. While I’m in my tall poppy syndrome mode, I’m going to take Mitchell Pearce down a peg. But that kid has been given a leg up his whole career because of that name. He’s given a free ride under the “learning curve” excuse whenever he has been poor, and has NEVER been dominant enough in matches at any real level to have earned double figures in Origin appearances. The only thing that maybe pushes his limit on the Grothe rule is that if he wasn’t picked all these times, who else was more deserving of the spot? This year the argument is for Reynolds, but previous years? I don’t know. RICHARD: On Pearce – I don’t know if you feel the same way, but I find comparing and contrasting father-son players a little tricky when they don’t play the same position (I envision similar difficulties down the track comparing Curtis and Paul Sironen’s careers). When Mitchell’s name first popped up in rugby league press, I automatically assumed he was a back-rower like his father and I was very surprised to hear that he was a halfback. The silver spoon in his hand wouldn’t be so glaring if his father hadn’t had such a stellar representative career for the Blues and coached them such that you can’t help but feel he (Wayne) probably still has some degree of influence in the NSWRL such that it’s parlayed into the number of games that Mitchell has amassed over the past 4-5 years. I think he’s been lucky to have been in the Blues set-up for as long as he has because guys like Terry Campese and Todd Carney really could have made those halves jumpers their own if it weren’t for injuries and personal issues respectively, and if they were given as many chances as Pearce has had – in peak condition, both Canberra products are supremely better than Pearce in my opinion. Daniel Mortimer – You could say that he made a wise move in electing not to play for the club that the Mortimer name is synonymous with – Canterbury-Bankstown – as for him to turn out in the Blue and White would have had people assuming his jumper was based more on strings being pulled at Belmore rather than on merit alone. 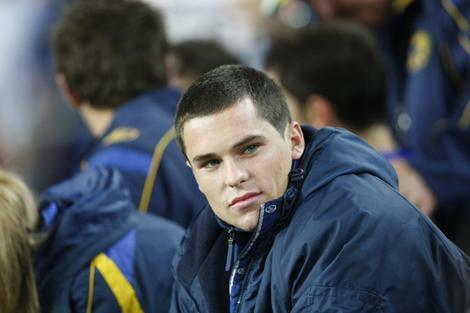 And as it turns out, his rookie season with Parramatta was remarkably successful as he formed a surprisingly effective halves combination with Jeff Robson that took the Eels on a fairy tale run to the 2009 Grand Final, the first team to do so after finishing in 8th position at the end of the regular season. Along the way, he scored 10 tries in 18 matches – a very respectable haul for a five-eighth, whose role is usually to create tries rather than score them. At this stage, you sensed that if he could keep this up, freeing himself of the shackles of the Mortimer name was going to be a formality, representative honours loomed (no doubt his name was bandied about as a long-term half solution for NSW at some stage) and that it’d only be a matter of time before he’d create his own legacy alongside his father and uncles. At this stage, it’s difficult to see him as anything other than an average to decent utility option coming off the bench who’ll produce a solid performance from time to time – if the next few years continue like this, it’ll be fair to assume that his admission into first grade sides will be as a result of him flashing the “Mortimer” ID card than anything else. This is amplified particularly when you consider that guys like John Morris, PJ Marsh and Isaac De Gois (all representative players at some level) don’t generate anywhere near as much media attention or “excitement” despite having broadly similar statures and abilities to Mortimer and each having notched up several consistent seasons in first grade before Mortimer even debuted. You can argue that Mortimer’s stock skyrocketed on the back of twin factors: i) an unforeseen and frankly unparalleled run of form by Parramatta (more specifically Jarryd Hayne) in 2009; and ii) his surname. The market simply corrected itself in the aftermath and what we were left with were assets that were no longer performing and had little prospects for growth in the immediate future. ME: I think the trick with the father/son comparisons comes in just having to compare that ill-defined greatness? In Mortimer’s case, there’s no doubt his relatives were all greater than him. On top of that I’m almost positive that his surname opened more than its fair share of doors for him. But does he fail the Grothe test? I mean he’s not even played much first grade, and when he spent last season in reserves, they won the comp, which suggests to me that his talent alone isn’t deplorable (like Fulton – the more I think about him, the more I remember how awful he was) so it kind of seems like he hasn’t gone anywhere a player of his equivalent wouldn’t have…? RICHARD: Yeah, as I was writing up my thoughts on Mortimer yesterday, I did wonder to myself whether it’s too early to make a call on his career and conclude that it’s largely been buoyed by his surname. He’s the freshest player we’ve raised in our discussions so far, he’s still pretty young and only floated in and out of first grade for four years. Gasnier and Fulton are both retired and spent a good number of years on the books at their respective clubs, allowing us to better gauge their careers and achievements. This makes me wonder, do we need set a further parameter – do we consider only retired players, or at least those who’ve played a certain amount of years or first grade games where we can say “Look, you’ve had more than enough time to step out of your relative’s shadow or at least demonstrate that you have the potential to, but you haven’t done so” and to take that into consideration when making our assessments? – I think this ties in well with the Grothe rule and gives us a measurable standard to work with? ME: I like it. It’ll be the Daniel Mortimer rule. And we’ll put a time limit on it. I think we can agree that Mitchell Pearce has had sufficient time to prove himself in his 6 and a half years in the NRL, so in the interest of me being able to keep him in the mix, I’m going to say that if they’ve been in first grade for the last 6+ years, they are fair game. I know this is controversial, but I’m also taking a slightly different approach to this one. I’m going to say that Josh got his start on Steve’s name, but has coasted on Brett’s name. Steve “Slippery” Morris was a legend of the sport (the nickname helped) in his day. His representative caps might not show it, but between 1982 and 1985 – when point scoring was at an all-time low – Slippery scored 64 tries in 100 matches. That is HUGE for that era. Hell, it’s pretty good now! Slippery Morris is a great of the game, and his twin sons rode the Slippery horse (wow that sounds dirtier than I mean it to) into the Dragons offices when they signed their first contracts. But Brett has always been the better of the two. He made his first grade debut 10 months before Josh. He started for Australia first. He’s won an NRL title. He’s played more matches for NSW and the Kangaroos than Josh, and he’s scored more tries in less matches in the NRL. Josh was let go by the Dragons because Wayne Bennett (are far more astute judge of talent than you or I) declared he was not good enough for first grade. Not that he wasn’t good enough to be a great player, or a rep player. Not good enough for first grade. Now, in my humble opinion, he has proven to be good enough for first grade. But NSW and Australia? I’m not so sure. He’s inconsistent, unreliable in defence (in his 6 Origin starts, QLD have scored 9 tries down his side) and frankly, no better than say a Beau Champion. He’s riding on the back of a good season in 2009 and his father and twin brothers reputations. RICHARD: Both brothers were prone to massive brain explosions and experienced roller-coasters of form when they played together at St George Illawarra such that the question of who was the better (or worse?) of the two was one that was remarkably difficult to answer! I think Bennett was vindicated in his call to release Josh, particularly with Matt Cooper and Beau Scott at his disposal – why take on a potential defensive liability? Sure, he went on to have a good 2009 with Canterbury and was neck-and-neck with Brett for the try-scoring title that year, but I think Brett has proven to be the better of the two over the past few years and has pretty much become an automatic selection for a wing spot both for NSW and Australia while Josh’s name seems to intermittently come into consideration depending on availabilities and form. Let’s also not forget Josh’s axing into NSW Cup by Jim Dymock when he was interim coach in mid-2011 – pretty ignominious honour for a NSW and Australian representative (I’m sure he and Michael Jennings are sharing stories about that in NSW camp at the moment). And I say all this with as little pro-Dragons bias as possible! The Morris issue got me thinking about whether Matthew Johns rode on his brother’s greatness and whether I could formulate an argument for it, but a glance at his statistics shows that he was solid enough in his own right to consistently earn his spot with the Knights – it just so happened that he was eclipsed by arguably the greatest player of all time, something he couldn’t really control. I’ll think about my next candidate, but happy to hear your thoughts on the Johns brothers while doing so. ME: I actually think that Matthew Johns is one of the most under-rated players of the last 25 years. I was stunned to see that he had only played 4 matches for NSW (yet 8 for Australia). He was a victim of the numbers 6’s of the era, no doubt, but I think at one point in his career, he was in the top 5 players in the world. That Andrew was his brother seems to overshadow all of that – and his appearances on the Footy Show where he shows his comedic side seem to take some gloss off too unfortunately. His career also fizzled out a bit as he was punted by the Knights due to salary cap issues (and almost came to Souths!) forcing him to head to England for a year before coming back to the Sharks and having to retire through chronic injuries. I think he’s one of the forgotten greats but I have no doubt that he understands the game just as well as Joey did – was just a victim of circumstance it seems. Scott Sattler – That tackle on Todd Byrne in the 2003 grand final. The number of times that it’s been replayed or alluded to in the past 10 years in the context of “big plays” is enough to make you think he was making those kinds of tackles in every game he played in during his career. But fact is, prior to joining the Panthers in 1999, Scott Sattler hadn’t even really played that many first grade games at all – 63 in total – despite having turned professional in 1992! That’s an average of 9 games per season over 7 years and would be enough to force most players to start handing out resumes to cafes and consulting the classifieds to find new work, but my suspicions are that the “Sattler” surname – made legendary by his father’s rough-and-tumble reputation and heroics in the 1970 grand final against Manly – kept him in the game for just long enough that he was able to find a home at Penrith. What’s interesting is that prior to joining the Panthers, the clubs where Sattler plied his trade were all basket cases: the Gold Coast Seagulls, a pre-Fittler/Gould Eastern Suburbs that hadn’t enjoyed any meaningful success since the late 70s and the South Queensland Crushers – the fact that he couldn’t consistently find game time with any of these teams until he signed on with the Chargers in 1997 (in the midst of the Super League War I might add) is pretty demonstrative of his overall ability (up until this stage, he’d played 15 games over 5 years). He was lucky not to have already hung up his boots by that point, but the fact that his father moved the family to Queensland and settled there in the latter stages of his career to play with Wests and Norths in the Brisbane Premiership and represent the Maroons on four occasions in the pre-State of Origin era no doubt endeared the Sattlers to the South East Queensland community and ensured that Scott would always have a safe home and paycheck to come back to if things ever went pear-shaped for him in his own rugby league journey. Unsurprisingly, save for one appearance off the bench for Easts in 1994, he spent his entire pre-Penrith career at two versions of the Gold Coast franchise and the Crushers! To his credit, he developed into a very solid team player at Penrith and took the opportunity given to him by adding another 140 first grade appearances to his tally and an Origin appearance from the Queensland bench in 2003 before retiring. You could say he was a late bloomer, but fact is he probably wouldn’t have been able to stay in the game for long enough to bloom at all if it weren’t for his father’s reputation and likely influence in the Brisbane-Gold Coast rugby league fraternity. He fails the Hayne test – aside from the aforementioned tackle and the sole Origin cap, I think most people who aren’t Panthers supporters would struggle to highlight anything else he did in his career aside from being John Sattler’s son. And he fails the Grothe test – no unrealised potential that I can reasonably identify. ME: I think Scott Sattler was definitely a late bloomer. He turned into a solid but unspectacular forward who would get through some dirty work for you and always made up for a lack of talent with effort. But does that earn you an Origin call up? I think that was a sympathy/nepotism selection for the Queenslanders. It’s funny though, you could spin it two ways – he was so average that he was let go by 5 clubs, or – he was so good that he convinced 6 clubs to give him a contract. I think he might have become a plumber, playing for the local pub team if it weren’t for the surname though. As much as I like him, I’ll back you on that one. Brenton Bowen – Surely got his start at the cowboys due to his cousin Matt Bowen. Had speed and nothing else – Played 45 games over 5 seasons for the Cowboys, then took a contract from the Titans, played 5 games and never played again. Says it all I think. And this is a special one that I noticed – Brett Fulton (Yes there was a worse Fulton!) played 2 NRL games (in his whole career, and over a 2 year span, and both off the bench) for the Eagles. And you thought Bobs first son got pushed through at Manly! RICHARD: Sattler’s humility and gratefulness for the opportunity given to him at Penrith made him very likeable. He was helped by the fact that he achieved his success in Sydney, a place where his father no longer exerted any considerable degree of influence (if any). Compare this to Scott Fulton, a complete asswipe who was clearly getting a ride simply because daddy was coach. ME: Ha! Good stuff in that article! And he really gives a good insider’s perspective on just how much Scott got by one the Fulton name! I think we might have ourselves a winner! RICHARD: Just want to emphasise that any similarities between the content of that article and my observations on Fulton in my entry on him are all co-incidental. I was amazed at the parallels between his piece and mine: number of games played, the solitary try and being dumped from first grade pretty much in sync with his father’s resignation from the head coaching job. Really makes you wonder who Bob Fulton thought he was fooling when even someone like me, who doesn’t even support the Eagles, can produce a mountain of evidence for this blatant case of nepotism-gone-mad at Brookvale. I can’t remember if I’ve talked to you about those League Of Their Own books that came out in the early 90s – essentially compendiums of anecdotes and funny stories by high profile rugby league players at the time (your dad probably owns them) – but I clearly remember one entry by Terry Hill (I know you hate him, but cast that aside for a moment) where he recounts his first encounter with Scott Fulton at Eagles training and was being called “Baulkham” by him, presumably as some lame joke alluding to Baulkham Hills and, in turn, Terrey Hills, and that he did this repeatedly such that Hill was about to lay him out before someone like David Gillespie pulled him up and told him he was Bob Fulton’s kid. Apparently Scott did this to many unwitting team-mates in the hopes of getting a rise out of them. Now if that’s not textbook shithead-son-of-the-coach behaviour, then they must have redefined the notion! ME: That’s it I’m calling it. Scott Fulton gets the championship belt. Good call on J Morris. He was decent in 2009, and very good in 2012 – a whole lot of average otherwise. All sorts of undeserved rep jerseys in there. Think you’re a bit harsh on Gasnier – there was a period in which he was legitimately the best centre in the competition. The latter years were garbage though. Here’s one on a different tangent – Shannon McDonnell. Got a hefty contract from the Tigers purely on the back of his old man being the ‘recruitment’ manager . First I’ve heard on the McDonnell front. Will have to do some investigating!